I think these are fantastic. 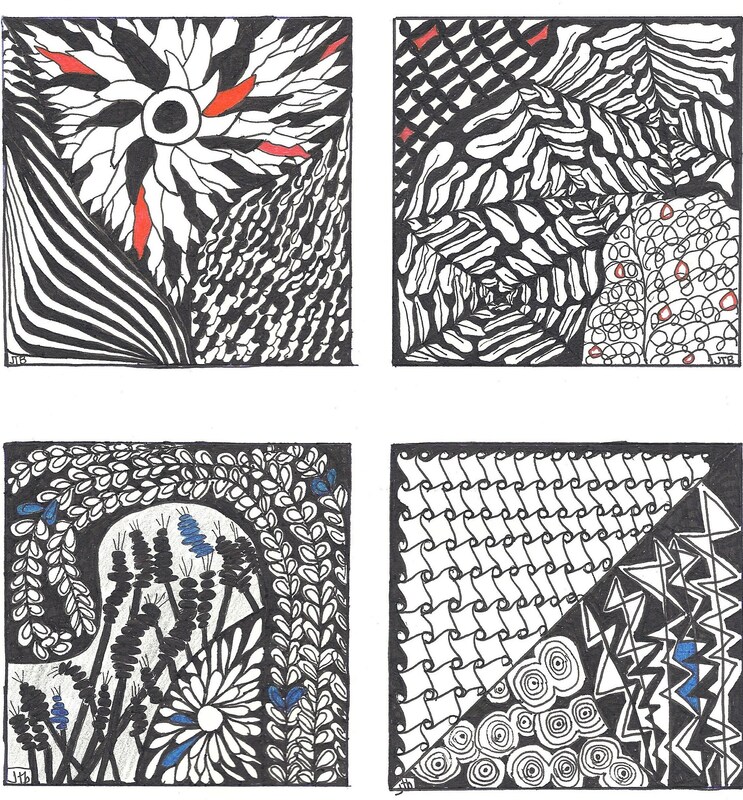 I’ve never heard of “Zentangle” but I think it is quite intriguing! You’re very talented to do something like this! Thanks, Kelli! That’s the beauty of this art – there’s no steep learning curve. Fancy doodling and coloring! Hmmm…maybe I’ll have to look it up. I wonder if they let artistically challenged people like me give it a try ? Beautiful! I love the two on the left – floral ones. I used to doodle when I was young, but nothing as interesting as this! Thanks, Jude. It was fun to do all four in succession to see my flow. Of course you’d be partial to the florals 🙂 i am, too, although I really like the scroll-y pattern on lower right. That one is fun to draw. These are lovely. How long does it take you to draw each one? Thank you, Eileen. I don’t know! Partly because I find myself drifting for moments . Sometimes I work on one for a few minutes then come back to it; sometimes I do a whole one in one sitting. I did these four in two evenings – maybe three hours total? The squares are about 4″ x 4″. :-). Thank you, Justine :-: I like the flowery ones best, too. I’m not sure I even like pattern art well enough to display it, but it is very soothing to do! I really like those. Can you direct me to a website so I can start learning? I’m big on doodling, it helps me listen better. I take notes, too, but never look at them since they are just a concentration tool. Hi Tina – http://www.zentangle.com is the site for “official zentangles. It’s a little too complex for me. I was able to get a few books through my library, so you probably can too – the one I liked best was by Beckah Krahula, and the other was by Kass Hall. Books are also available at Amazon. Awesome, Sammy ! I am soooooo glad you introduced this to me. I am having a blast. It is the perfect break in between the intensity of other projects. Relaxing, peaceful, flowing. I will post a few more soon. 🙂 it’s hailing here !! Crazy weather! Absolutely, great idea, I’m in. Whenever I doodle I come up with stick men. Thanks for the introduction. I must look this up. 🙂 that’s me, too with the stick men! Read my response to Tina in comments if you want website and books to look at. So many ways to pattern. Even stick men !! Thank you, Celine 🙂 i hope you had a nice weekend of play in Shanghai!